As Dani said in the “Our favorite things” post, we carefully chose our equipment for this trip. While the criteria varied slightly with each piece of equipment, we always placed a high priority on durability. Two and a half weeks into the trip, we’ve suffered a number of equipment failures. Some of them are less serious than others, but all are annoying. 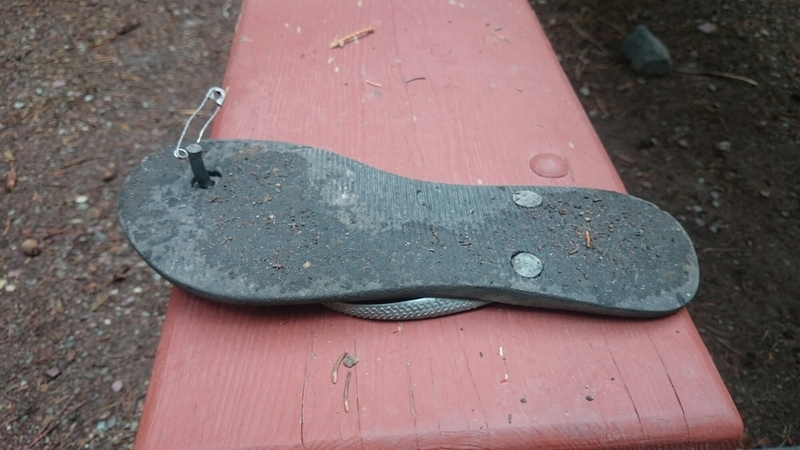 We understand that even durable equipment wears out over time, but it is an understatement to say that we weren’t expecting anything like the number and extent of the failures we’ve experienced so far. Without further ado, here’s a few of our things that have fallen apart. We’ve covered this thoroughly, but boy was this a kick in the pants. 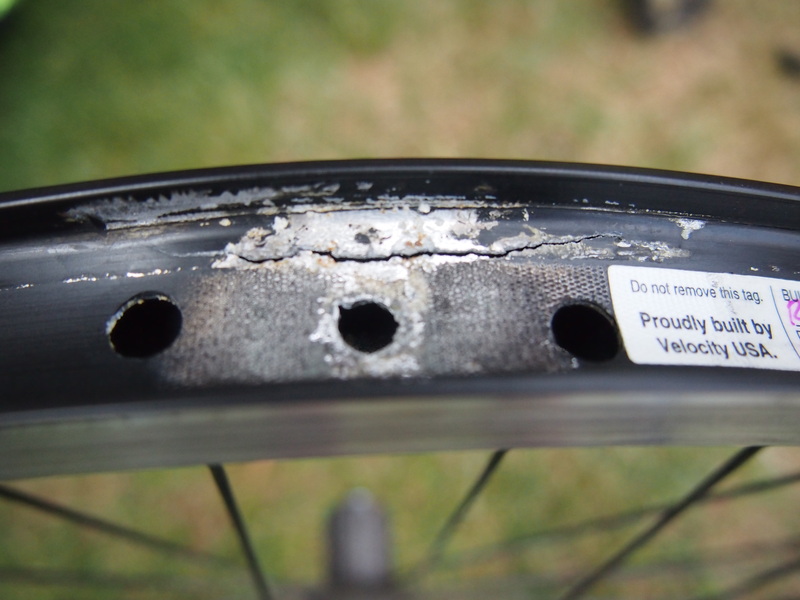 A supposedly indestructible wheel that inexplicitly fails after only 6,000 miles. A shipping mistake that strands us for a week. This really shouldn’t have failed, but it did, and now we’re here. 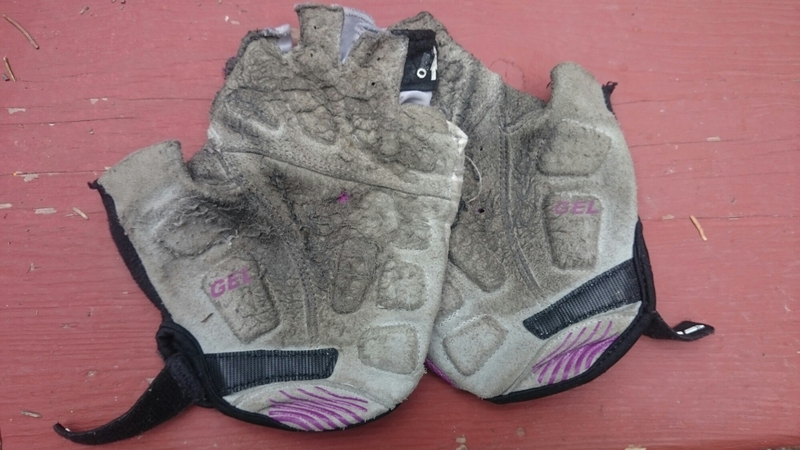 Six days into the trip, Dani’s three-year-old flip flops gave up the ghost. This wasn’t the most shocking of our equipment failures, nor was it the most serious. 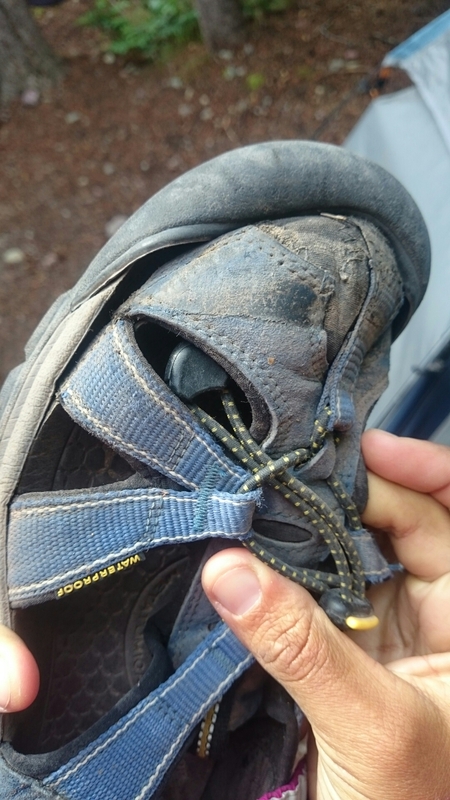 But it certainly is cause for consternation when you only have two pairs of shoes and one of them breaks. Luckily, Dani was able rig up a temporary fix with a safety pin, and it’s holding up well so far! 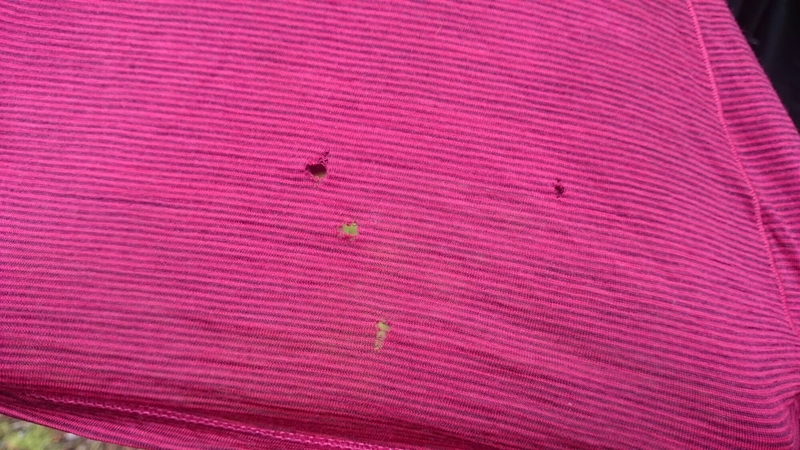 I can’t figure out if these belong in the “it’s understandable they’re falling apart” category or not. Yes, we’ve had them for a couple of years, but we haven’t really used them all that much. In any case, the area that most often comes in contact with the handlebar is wearing away and holes are developing. We probably won’t replace these any time soon, maybe when we visit REI in Minneapolis. My sleeping pad has been suffering from a slow leak since the beginning of the trip. Again, it isn’t a terrible problem. 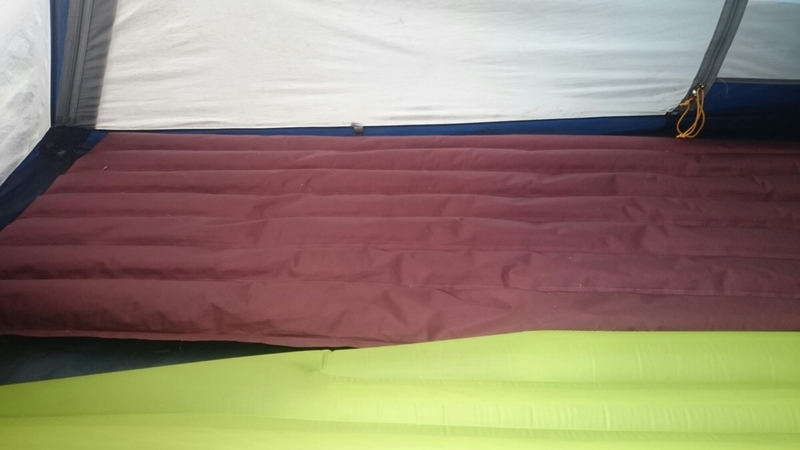 We inflate it to full right before we get in the tent, and then it slowly leaks throughout the night. When I wake up early in the morning to use the restroom, it’s probably about 40% full. I’ve become accustomed to sleeping on a half-inflated sleeping pad, but it is getting a bit tiresome. And I know that Dani probably gets a tiny bit annoyed when I try to scooch onto her tiny sleeping pad in the morning. It rained on our penultimate day in Many Glacier. It was a strong, persistent rain that started at around 8:00p and continued until 9:00a the next day. But hey, even though our tent may not be completely waterproof any more, at least it is water resistant enough that we didn’t get too too wet. We spent the entire night trying to ignore the rain that was falling on our faces. By morning, everything that wasn’t in one of our panniers (which are waterproof) was drenched. 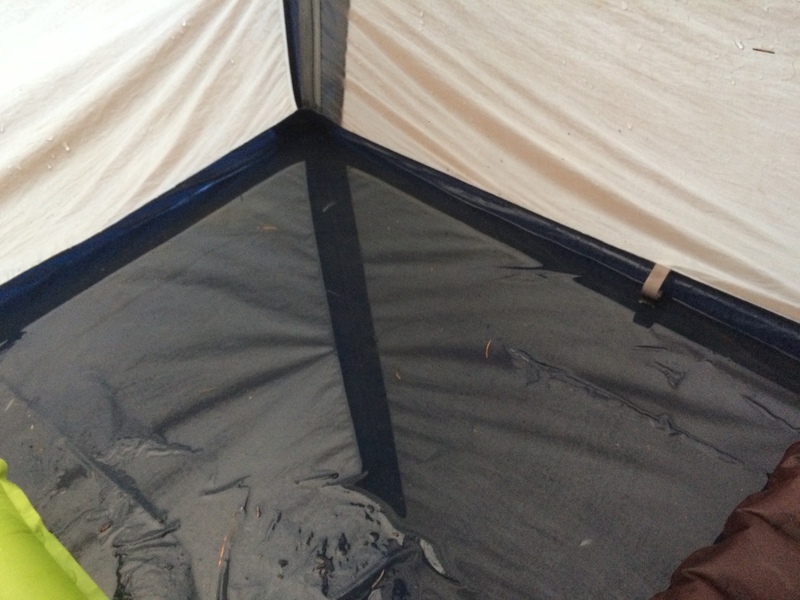 Our sleeping pads were just about floating in the gallon+ of water that was sitting on the floor of our tent. The gallon of water on the tent floor broke the back of the proverbial camel. As soon as we emptied and hung up the tent, we walked up to the Inn (passing on the way, for what it’s worth, another Sierra Designs tent hanging out to dry), got online, and purchased a new tent, a new sleeping pad for me, and a new pair of flip flops for Dani. We’re having them shipped general delivery to a town a few days ahead of us. As long as it doesn’t rain in the next couple of days, at the very least we’ll be safe and dry in our tent from then on! We’re not replacing everything, but hopefully everything else holds together for the rest of the trip!